A scene from a shooting in Dallas that killed five police officers on July 7, 2016. CHICAGO — City officials and activists spoke out Friday against attacks on police following the shooting deaths of five Dallas officers. The Thursday evening attacks in Dallas — which also left seven officers and two civilians wounded — came after a protest there against police brutality. Activists had gathered in various cities throughout the country Thursday to protest and march after the fatal police shooting deaths of Alton Sterling in Baton Rouge, La., and Philando Castile in suburban Minneapolis. "All of it, the last few days, all of it is heartbreaking," said Ald. Ameya Pawar (47th). "All of America woke up this morning to the horror of police officers being ambushed in Dallas, and our hearts go out to the victims and their families," said Mayor Rahm Emanuel in a statement released Friday. "It is a tragedy that follows two other shocking shootings in Baton Rouge and in Minneapolis. As a country and as a city we can never accept acts of ‎violence anywhere, at any time, against anyone, for any reason." Chicago Police, which urged officers to use caution and work in pairs after the Dallas attacks, tweeted that the department sends "thoughts and prayers" to the families of Dallas officers. Supt. Eddie Johnson was going to reach out to the Dallas Police Department and offer assistance, police said in a news release. The Chicago chapter of Black Lives Matter said that activists have been calling for an end to violence and denounced the killing of the Dallas police officers. "This is a tragedy — both for those who have been impacted by yesterday's attack and for our democracy," the group said. "There are some who would use these events to stifle a movement for change and quicken the demise of a vibrant discourse on the human rights of black Americans. We should reject all of this." The Chicago Police Memorial Foundation, which honors officers, called the shooting a "tragedy" that was "magnified tenfold" because officers had been targeted. The foundation said its counseling services and support would be available to officers. "The tragedy in Dallas is no doubt weighing heavily on the minds of Chicago Police officers and their families," the foundation said in a news release. "Throughout Chicago today, the children, spouses and families of Chicago Police officers will give their loved one an extra hug as those officers head to work, deeply concerned for their safety and eagerly awaiting their return home after their tour." "What happened in Dallas was a purely evil, cowardly act," said Chris Southwood, president of the Illinois Fraternal Order of Police union. "Those responsible should face the swiftest and most severe justice that our nation allows. The fallen are heroes who made the ultimate sacrifice serving and protecting the community they loved. Ironically, these heroes, some of whom were shot in the back, were protecting participants at an anti-police protest. Our hearts, our thoughts and our prayers go to the fallen and their families, the survivors and their families, friends and fellow law-enforcement officers, as well as the civilians who were injured by these despicable acts." Ald. Nicholas Sposato (38th), whose Far Northwest Side ward is home to many police, echoed that, calling the shootings a "cowardly, despicable act." "I think everybody's upset and it's despicable," Sposato said. He said officers wary of violence should "be careful out there. Watch their backs." The shootings will hurt officer morale in Chicago, predicted Ald. Anthony Napolitano (41st), a former police officer. "Most police officers, most citizens in general, are disgusted by this act," Napolitano said. "It's an atrocity." The city needs to focus on educating people, particularly children, on how police officers work and what police brutality is, Napolitano said. That would help officers and communities work together and understand each other more. Officers could also receive more sensitivity training and should be taught to think "put yourselves in their shoes" when arresting someone, Napolitano said. "We have got to take all this money that we're dumping into hearings and start dumping it into" schools and educational programs, Napolitano said. There are police officers and members of the activism movements who are "bad apples," Napolitano said, but he thinks that overall movements that push for more respect and justice for people of color and police are good because they highlight the importance of all lives. "Do I think that's the trend or overall feeling or sentiment? I don't," Napolitano said. "I think they're great causes." Emanuel and Pawar likewise called for moderation. "We cannot be a country where our differences define us — be it profession, race, creed or sexual orientation," Emanuel said. "We must recommit ourselves to our common values to confront corrosive violence. We must build a dialogue that builds trust between us all. That is the foundation of this nation, that is what binds us together and that is what we all must strive towards every day." "If we're going to be reasonable and have a rational conversation about this, we need to understand the humanity on both sides — the humanity of the people who are being gunned down needlessly, and the humanity of the officers," Pawar said. "We need to understand they are also under a lot of stress. "The key is to understand we're on the same team here," he added. "We need to better support our officers and their families." "It's like the same anti-police [versus] police debate," he added. "It's so polarized that we have to come back to the middle and find some common ground. Dividing ourselves in this country based on are we pro or anti gun, pro or anti police, is just not a fruitful conversation. It's not reflective of what most people believe." Ald. Ariel Reboyras (30th) also publicly called for people to "cease hatred and share love" on Twitter. We must cease hatred and share love. I pray for all the lives that have been taken. And I pray for every Police Officer in the line of duty. Friday at City Hall, Reboyras expressed concerns the incident could lead to "copycats," adding, "That's usually the trend," but he also said it could provide the political impetus for meaningful gun control. Ald. Raymond Lopez (15th), who has a resolution calling for a national ban on assault weapons set to be considered by Reboyras' Public Safety Committee next week, echoed that. "Hopefully, at some point, it will have an impact," he said of the violent incidents across the nation. 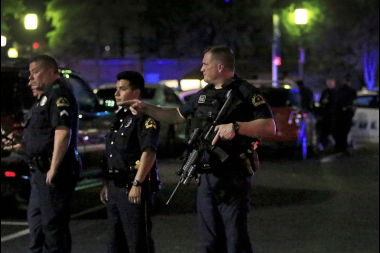 "Obviously, last night in Dallas an AR-15 [assault weapon] was used to gun down five police officers," he added. "That just speaks volumes to the impact these weapons have on the streets. Our police, our citizens, everyone is under assault from these weapons, and we have to keep the pressure going even if it falls on deaf ears in Congress." Yet Southwood turned the incident into an attack on President Barack Obama, saying the police union expresses "our disappointment with the current president, who vowed to unite the country and now eight years later we are more divided than before. More and more people think it is OK to demonize and urge violence against police officers, and this is a situation the president has done little to correct. I call upon all our political leadership, state and national, to tell the nation specifically what they intend to do to stop the senseless slayings of those who protect our way of life in every American community." Chicago activists spoke out against the violence, saying it did not represent their movement. They had also marched in the city on Thursday night, shutting down streets, including the Dan Ryan Expressway. We are sending peace and love to all those affected by the violence in Dallas. Gov. Bruce Rauner said there was a need to rebuild trust between communities in police as he spoke out against the attacks in Dallas while also addressing police-involved shootings. "The ambush attack on Dallas police officers is outrageous.The men and women who work every day to protect everyone, including those exercising their right to free speech, deserve our respect and support," Rauner said in a statement. "The shootings in Louisiana and Minnesota that led to last night's protests, are deeply distressing. All of these events speak to the lack of unity and trust in many of our communities and underscores the urgency in addressing that lack of trust."